Educated entirely in Hillsborough County public school system through high school, Keith graduated from Florida A&M University in 1989 with a B.S. degree in Political Science and minor in Labor Relations Management. A twenty-five year career Human Resources professional who is frequently called on to speak on the issues of leadership and management, as well as recruiting and job readiness. Born on February 4, 1965 in Lakeland, Florida to parents Howard A. Harris Jr. (Deceased Educator) and Ethel Harris (Deceased Medical Technologist) who were both Tampa natives. Lived most of his life here in the Tampa Bay area currently residing in Riverview. Married to local attorney Monica (Williams) Harris. Three daughters. Board Member – American Cancer Society Volunteer Board, Hillsborough Sickle Cell Association, and GZL Educational Fund, Inc.
Sickle Cell Association Hillsborough Cty Inc. 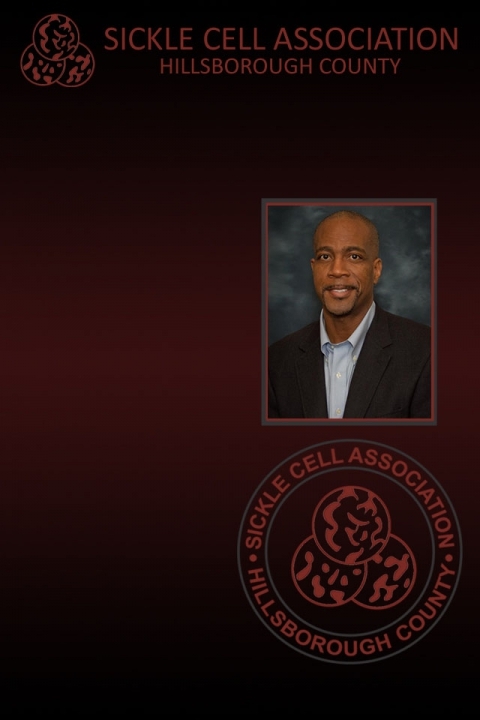 The mission of the Sickle Cell Association of Hillsborough County, Inc. is to help individuals with sickle cell conditions live lives that are, to the maximum extent possible, unhampered and uncompromised by their sickle cell conditions. <p rgba(255,="" 255,="" 0);="" margin:="" 0px="" 10px;="" padding:="" 0px;="" border:="" font-stretch:="" inherit;="" font-size:="" 14.6667px;="" line-height:="" 22px;="" font-family:="" helvetica,="" arial,="" sans;="" vertical-align:="" baseline;="" color:="" rgb(72,="" 72,="" 72);"="" style="-webkit-tap-highlight-color: rgba(255, 255, 255, 0); margin: 0px 0px 10px; padding: 0px; border: 0px; font-stretch: inherit; font-size: 14.6667px; line-height: 22px; font-family: Helvetica, Arial, Sans; vertical-align: baseline; color: rgb(72, 72, 72);">The Sickle Cell Association of Hillsborough County was established in 1976. For over 35 years, it has provided materials to educate persons with sickle cell concerning medical, sociological, and psychological implications of sickle cell disease and trait. Counseling is provided to individuals and families diagnosed through the Newborn Screening Program. Educational programs are conducted to community groups, health care providers, and public and private schools. The organization also provides medical and social services referrals to individuals and families affected by disease. SavvyCard is an online business card that makes working with Keith as easy as tapping a button! Tap the Call, or Email buttons to contact Keith directly. Tap the Share button to share Keith's SavvyCard with anyone you think might be interested. Are you sure you want to remove this card from your deck?